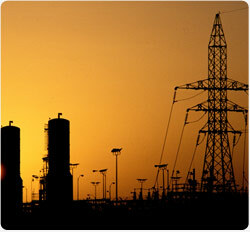 The energy sector is the backbone of the Saudi economy. The Kingdom possesses a quarter of the world’s proven oil reserves, and is the world’s largest producer and exporter of oil. Saudi Arabia is also developing its additional energy resources – natural gas that once flared off oil wells is collected and used, and the Kingdom has become a producer of refined oil products and petrochemicals such as kerosene, diesel oil and gasoline. In addition, with the discovery of deposits of precious and semi-precious metals, Saudi Arabia expects to become a major exporter of minerals in the coming decades. Saudi Arabia has taken steps to expand the energy sector and encourage greater investment, especially by foreign companies. In May 2000, the Supreme Council for Petroleum and Minerals (SCPM) – which oversees the maximization of natural resources – announced a decision to allow foreign investment in the gas sector and downstream industries. Saudi Arabia continues to invest in the energy sector. In September 2006, the Kingdom announced plans for $70 billion in oil and gas programs over five years. Saudi Arabia has a massive electricity distribution network that extends to cities, towns and villages across the country. Its network consists of 8,750 miles of transmission lines, 52,000 miles of distribution lines and over 53,000 miles of service connections. The Kingdom also uses desalination plants to generate electricity using the steam that is a byproduct of the desalination process. The Kingdom generates more than 26,300 MW of electricity, 2,800 MW of which is produced by the desalination plants. Saudi Arabia eventually plans to increase the electricity produced by these desalination plants to equal half of the total output. The Saudi Electric Company (SEC) manages existing power generation, distribution and delivery facilities, as well as investment in new general plants. Wholly owned by shareholders, the SEC also sets the price of electricity sold to consumers and industry under rules set by a governing body based on the cost of production, distribution and services. Saudi Arabia possesses vast reserves of natural gas – dissolved, associated and non-associated – which it uses as an environmentally friendly energy source for urban and industrial use. Major industrial facilities also use gas as feedstock to produce petrochemicals, fertilizers, steel and other products that in turn feed a thriving industrial sector. Exploration of the Kingdom’s natural gas resources remains ongoing. Major deposits have been discovered in the Eastern Province near Abqaiq and southwest of the Ghawar oil field. Until the 1970s, most of the natural gas produced in the Kingdom was in association with crude oil production, and was flared off at the well. An ambitious project known as the Master Gas System allowed Saudi Aramco to collect the gas and pipe it around the country. Saudi Arabia also actively promotes foreign investment in natural gas. In July 2003 an agreement was signed with Royal Dutch/Shell and France’s Total to develop upstream gas operations in the Empty Quarter (Rub’ al-Khali). 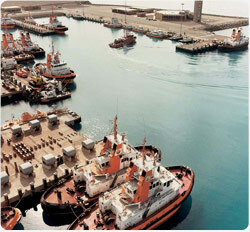 In March 2005, additional contracts were signed for two vast oil and gas projects. Saudi Arabia has nine refining complexes that produce gasoline, fuel and diesel oil, liquefied petroleum gas, jet fuel, kerosene and other petroleum products for the domestic market and for export. Considered among the most technologically advanced in the world, these refineries have an output of eight million barrels per day of petroleum products, most for export. 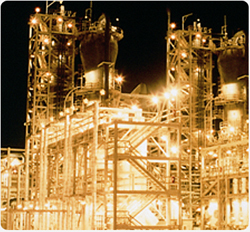 The Kingdom continues to invest in its refineries. 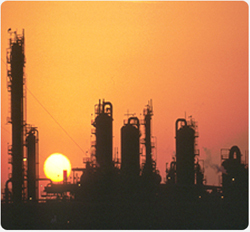 In May 2005, Saudi Aramco announced plans for a new refinery in Yanbu with an anticipated capacity of 400,000 barrels per day of petroleum products. Plans are also underway for a new refinery at Jubail that is also expected to have a capacity of 400,000 barrels per day. Saudi Arabia has entered downstream operations in other countries, including South Korea, the Philippines, Greece, India, and China. Motiva – a joint venture between Shell Oil Company and Saudi Refining Inc. – refines, distributes, and markets oil products in the United States. Saudi Arabia is also looking at alternative energy sources, including solar energy. The Kingdom receives some of the most intense sunlight in the world – 105 trillion kilowatt hours a day, which is roughly the equivalent of 10 billion barrels of crude oil in energy terms. Solar energy is also an appropriate energy source for use in remote locations. As an example, it is used to power emergency telephones and signs along vast stretches of desert roads. Scientists at the King Abdulaziz City for Science and Technology (KACST) are working on groundbreaking projects to make solar power generation more economically feasible. Other programs focus on utilizing solar energy for water desalination, agriculture, and the generation of hydrogen. Projected applications for solar energy include using it to power water pumps, refrigerators, air conditioners, heaters and communications equipment, as well as to run pipeline anti-corrosion units in remote areas.